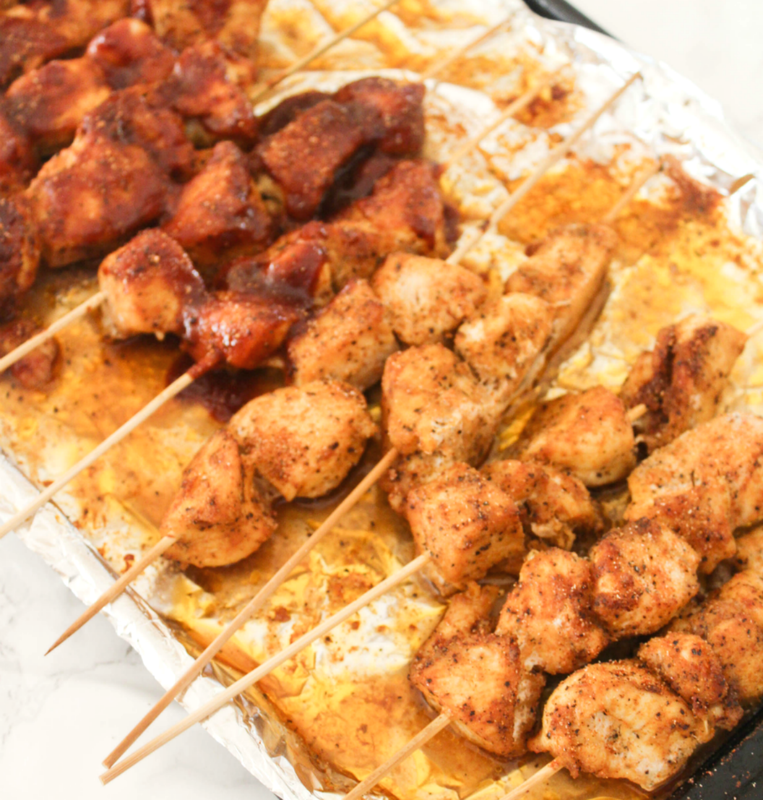 You are here: Home / Home / Easy Delicious Chicken Skewers – Your Family Will Love! 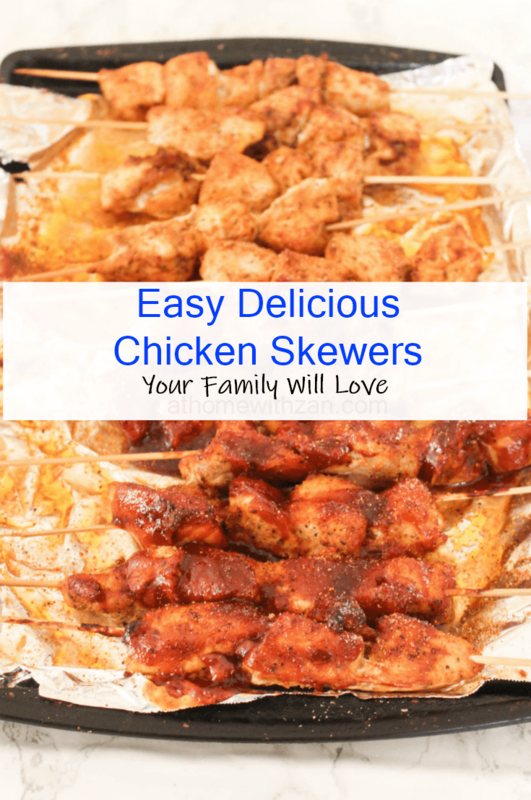 These oven baked chicken skewers are so simple to make and they are so tasty that your whole family will love them! One Saturday evening I wanted to make a different dinner than the regulars. We were beginning to get bored with the same old stuff and wanted a different taste. I had bought some skewer sticks with the intention of making skewers and they were just sitting in the pantry. Keep in mind that I had not make skewers since our first was about 4 and she is now 7. Part of it is because the kids were tiny and I was unsure if they would be able to eat properly from a stick and the other part is I always kept forgetting to get the sticks to try it out. But that one day when we craved different, the entered my mind about using some of those sticks and making chicken skewers. And I am so glad I did! 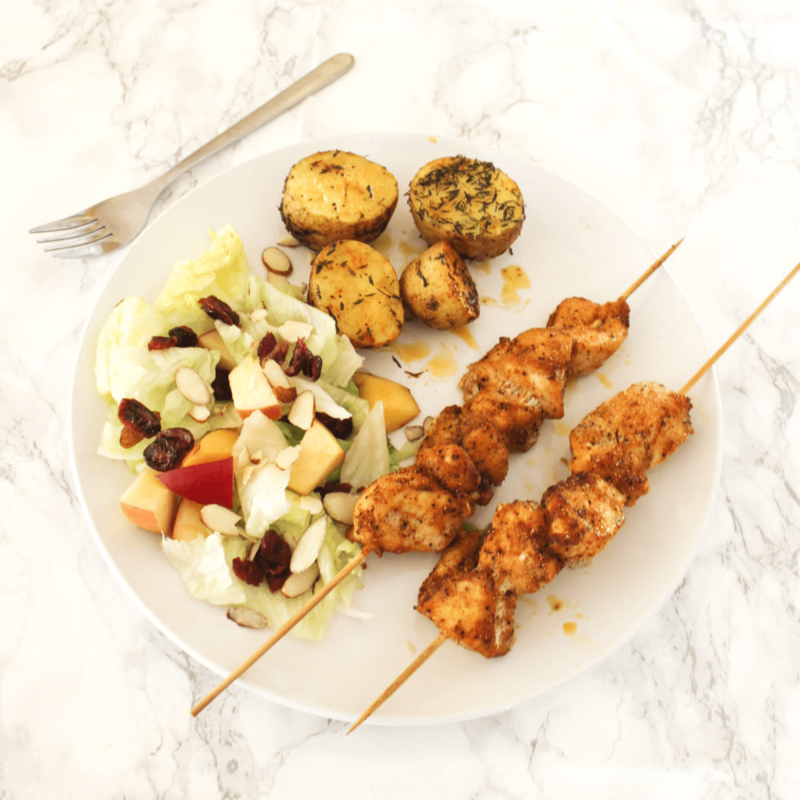 Let me tell you, these skewers were a HUGE hit! Think tasty chicken on a stick!! The kids couldn’t get enough, especially the eldest who has been taken up with trying new things. My husband also compliment me on how much he loved it. I paired it with a simply chopped lettuce and strawberry salad and some white rice. When I heard all the compliments and saw the on all of their faces the kids faces I knew I wanted to make it again. And so I did. The salad was slightly different since I had no strawberries and instead of rice I made baked potatoes with olive oil and seasonings. Only one kid eats potatoes, though so I added a side of cooked corn kernels, too (not in photo). Also, I added a small amount of BBQ sauce to half the skewers during baking since last time some of us used it as a dipping sauce. Again, the skewers were a hit! My husband was out of town so it was just the kids and me. We ate to full tummies and everyone really enjoyed dinner. Preheat the broiler or oven to 400 degrees. Line a baking sheet pan with foil to protect your pan and to make clean-up easy. Spray with cooking spray or grease with oil. Set aside. Tip: Oils such as Coconut, Canola, Avocado and Olive are of the better kinds. I always buy cooking sprays made from 100% extra virgin olive oils. Place the chicken pieces in a medium sized bowl. Set aside. Mix all the seasonings together in a small bowl. Reserve 1 tsp of the seasoning mix. Toss the rest over the chicken and mix it until all areas of the chicken are covered with the seasoning. Mix in the olive oil. If you prep early, you can let the chicken marinate in seasoning in the refrigerator until ready to cook. But if you need to get dinner on the table “right now” then marinating is not necessary. 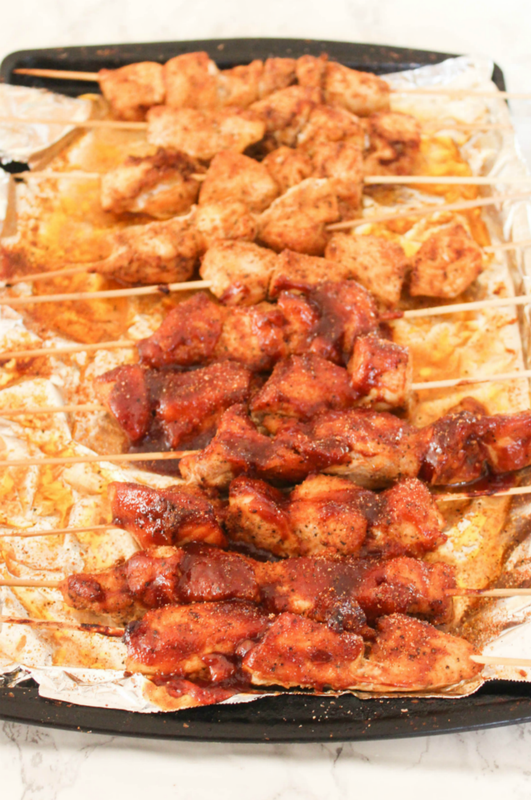 When ready to cook, place the skewers on baking pan. Broil or bake about 20 minutes. Turn skewers over and broil an additional 15 -20 minutes. If adding BBQ sauce, brush each skewer (or half of them) with sauce then return to broiler for the last 5 minutes of cooking. Note: If you find that the chicken is browning too fast use some foil to cover it during baking. Remove foil during the last 10 minutes or of baking. You want that nice brown color that is not too burned. Sprinkle with the additional 1 tsp seasoning mix. If not serving right away, then cover with foil to cool. Tip: I like to cover with foil or something similar to keep the chicken from blowing out in the air and turning out too dry. It also keeps it warm a little longer if I’m still finishing prep sides before eating. It’s really easy to make and your family will love it. Use your favorite BBQ sauce (low calorie, healthy, special diet sauce) or other sauce for dipping or skip the side sauce altogether. The chicken is tasty on its own. Do you make skewers? Do your kids seem to find them a delight and does it make dinner or meal time a little bit more fun to eat?